Gustave Moreau (1826–1898), Orpheus (detail) (1865), oil on panel, 154 × 99.5 cm, Musée d'Orsay, Paris. Wikimedia Commons. 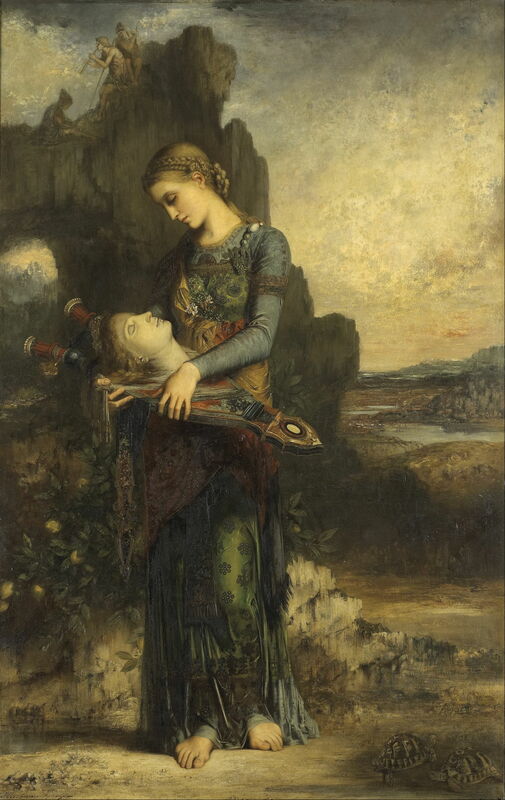 Gustave Moreau’s Oedipus and the Sphinx had been the talk of the Salon in 1864, but the following year his two entries were lost in the noise surrounding Manet’s Olympia. Moreau needed to do much better at the Salon in 1866 if he was not going to slip back into obscurity. Gustave Moreau (1826–1898), Diomedes Devoured by his Horses (1866), watercolour on paper, 19.1 × 17.1 cm, Private collection. Wikimedia Commons. This watercolour study of Diomedes Devoured by his Horses (1866) was intended to be one step in that direction. Its story is hardly sophisticated or subtle. Diomedes, the King of Thrace, not to be confused with the Greek hero of Homer’s Iliad, was at the centre of the eighth of Heracles’ (Hercules) twelve labours. After Heracles had captured the Cretan Bull in his seventh labour, he was sent to capture the Mares of Diomedes. The king had the reputation of being a savage, and took pleasure in feeding prisoners and strangers to his mares, who apparently preferred them to more conventional fodder. These mares were as savage as their owner, and had to be tethered to a bronze manger using chains to prevent their escape. Heracles had to wrestle with Diomedes to overcome him, then took him to the stables. Diomedes was put in with the mares, where they started to devour him; in doing so, they were finally cured of their unnatural hunger for human flesh, and Heracles was able to take the horses back in completion of his eighth labour. 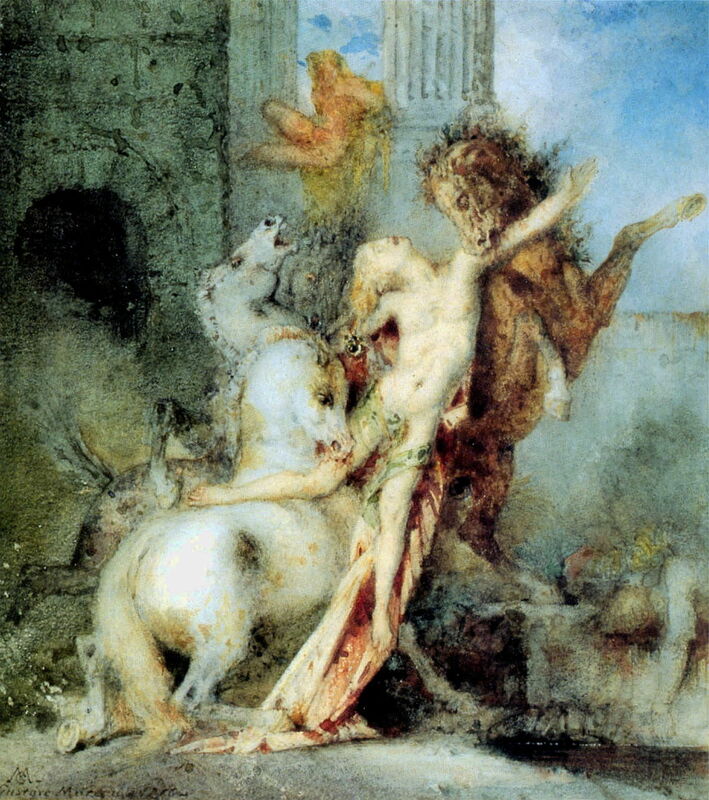 Moreau’s study shows the gruesome sight of the mares starting to devour Diomedes in their frenzy, while Heracles watches from safety in the background. It was as theatrical a narrative as any that Moreau could have chosen, the sort of scene that even Gérôme might later have shied from. Gustave Moreau (1826–1898), Diomedes Devoured by his Horses (1866), oil on canvas, 140 × 95.5 cm, Musée des Beaux-Arts, Rouen, France. Wikimedia Commons. 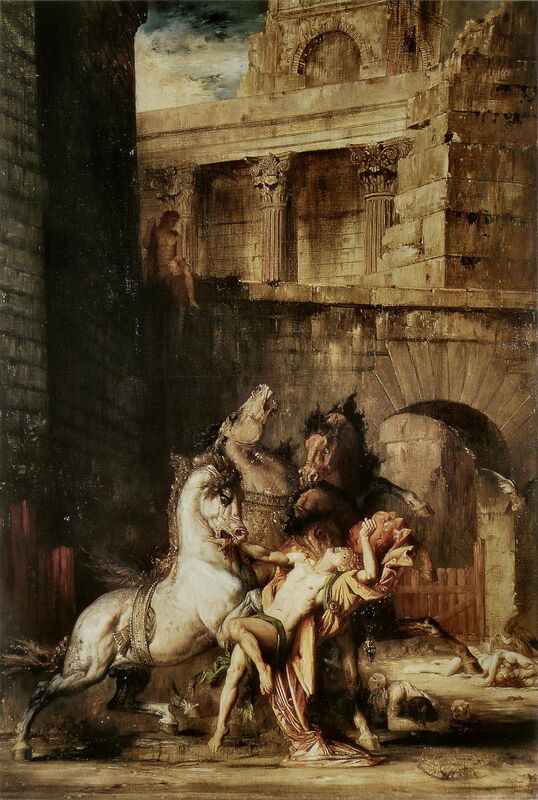 Moreau’s finished painting of Diomedes Devoured by his Horses (1866) drew back slightly from his sketch, in showing the scene a little earlier. But it maintains all the elements of theatrical narrative, with Heracles sat at his safe vantage point watching the king die horribly. Diomedes’ fallen crown, at the lower right corner, is its only moment of subtlety. 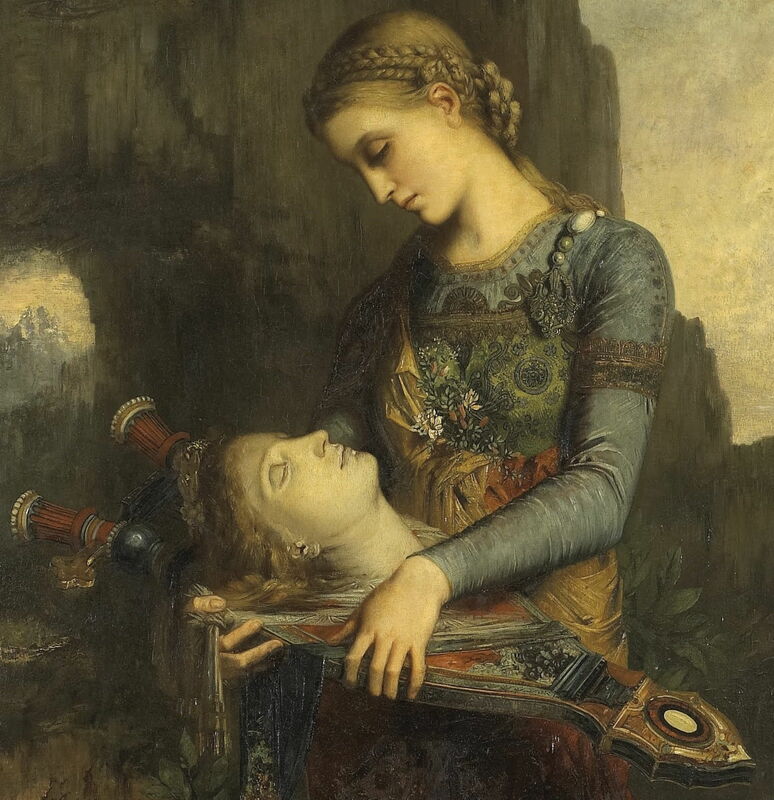 Moreau’s other submission for the Salon of 1866 could not have formed a greater contrast. Orpheus (1865, although it was probably finished in 1866) is a peaceful reverie and possibly not, in the strict sense, even narrative. Orpheus was the great musician of Greek legend, best-known for his attempt to rescue his wife Eurydice from the Underworld, and frequently painted in that role. Later, he developed a disdain for the worship of gods other than that of the sun. Early one morning he went to the oracle of Dionysus at Mount Pangaion to salute the sun as it rose. However, he did not honour Dionysus, and as a result a group of Thracian Maenads (Bacchantes) tore him to pieces in their fury. 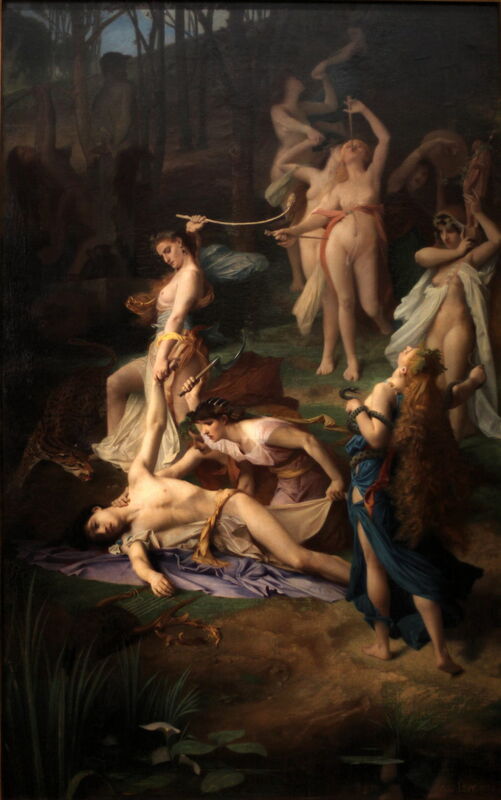 By a curious coincidence, the Salon of 1866 also included a more conventional depiction of the same event, in Émile Lévy’s Death of Orpheus (1866). Lévy shows the moment before the first wound is inflicted: Orpheus, remarkably young-looking, has just been knocked to the ground, and looks stunned. Two Maenads kneel by his side, one clasping his neck (almost as if feeling for a carotid pulse), the other about to bring the vicious blade of her ceremonial sickle down to cleave his neck open. Another wields her thyrsus like a club while pulling at the man’s left hand. Their priestess, her head thrown back to emphasise her extraordinary mane of hair, is entwined with serpents, and officiates at the sacrifice. In the shadows at the top left, the figure of Dionysus (Bacchus) stands, looking away from the scene below as a naked celebrant cavorts behind him. Lévy, like Moreau in his Diomedes Devoured by his Horses, avoids any gore or visible carnage, but gives obvious clues as to what is next in this theatrical scene. Moreau has none of that. A sombrely-dressed Thracian woman (perhaps a subtle link with Diomedes?) holds Orpheus’ lyre, on which rests his head, blanched in death, as if affixed to the lyre like the head of a hunting trophy. Her eyes are closed in reverie. One version of the legend of Orpheus’ death holds that his head and lyre were borne by the river Hebrus, which is shown in the background landscape to the right. Again, though, Moreau pursues his own adjusted version of the written narrative, as according to that account (in Ovid’s Metamorphoses, book 11), the head and lyre were washed up on the coast of Lesbos. Cooke points out Moreau’s theoretical interest in ‘modes’, drawn from Poussin, who in turn derived them from Greek music. Orpheus adopts a unified tonality, colour, form, character, and style which could be viewed as such a ‘mode’. The gentle and natural beauty of the Thracian woman, her ornate clothes, flowers, and the strange beauty of Orpheus’ head on the lyre contrast with a harsh and barren landscape, which might have been more appropriate in a Renaissance painting, perhaps by Leonardo da Vinci. Moreau has carefully avoided elaborate symbols and decoration, although he has left us two further puzzles at the painting’s corners: the three figures, apparently shepherds, on the rocks at the upper left, and a pair of tortoises at the lower right. The figures refer to music, which seems in keeping with Orpheus and his lyre, but the significance of the tortoises is a mystery on which we can only speculate. What Moreau lost in the absence of narrative, this painting gained in its remarkable tranquillity. Two faces, eyes closed, (don’t) look at one another. The intricate decoration of the lyre seems unified with the Thracian woman’s clothing, even the coiled braids of her hair. I find this one of Moreau’s most profoundly beautiful and moving paintings, but neither it, nor that of Diomedes, impressed at the Salon. I cannot help thinking that these two works were intended as a personal statement when taken as a pair: Diomedes with the gory death of the King of Thrace as its theatrical narrative, and Orpheus with its serene reverie of a Thracian woman as its anti-theatrical non-narrative. Both involved the furied dismemberment of their victim. Could it be that Moreau added the tortoises to Orpheus as the antithesis of the horses in Diomedes? Moreau also exhibited two drawings at that Salon, one of which is a gem in itself, and a sign of things to come. Gustave Moreau (1826–1898), Une péri (a project for enamel) (1865), graphite, black ink, grey wash, gold highlights and white gouache on paper, 35 × 25 cm, The Art Institute of Chicago, Chicago, IL. Wikimedia Commons. Une péri (a witch or fairy, a project for enamel) (1865) was probably Moreau’s first finished work to display an ‘Oriental’ influence, here that of the Indian sub-continent and/or Persia. 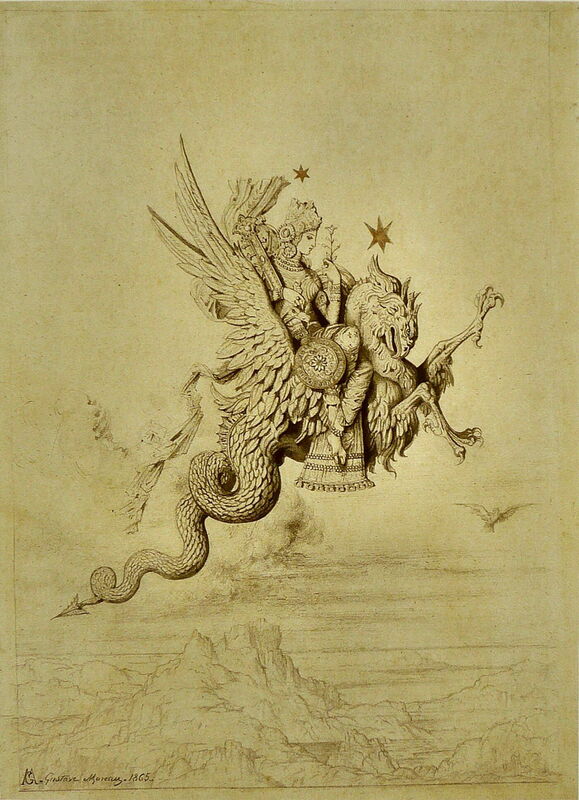 Its flying dragon, with an ornately-clothed woman on board, is an innovative mixture of Persia, India, and China, and a taster of imagery to come. 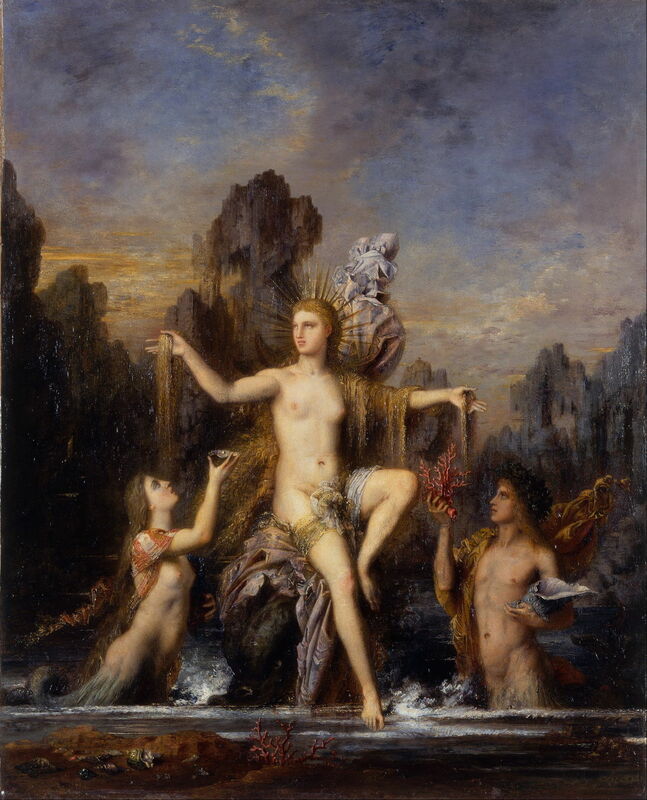 Gustave Moreau (1826–1898), The Birth of Venus, Venus Appearing to the Fishermen (c 1866), oil on panel, 21 × 26 cm, Private collection. Wikimedia Commons. Around this time, Moreau painted two little-known works featuring Venus. The Birth of Venus, Venus Appearing to the Fishermen (c 1866) is a promising oil study, in which Venus is seen just after she has emerged from the sea, in front of a group of rather rugged fisherfolk. In the background, only sketched in, is an old sailing vessel, its sails reefed, with a distinctive appearance which will appear in future paintings. 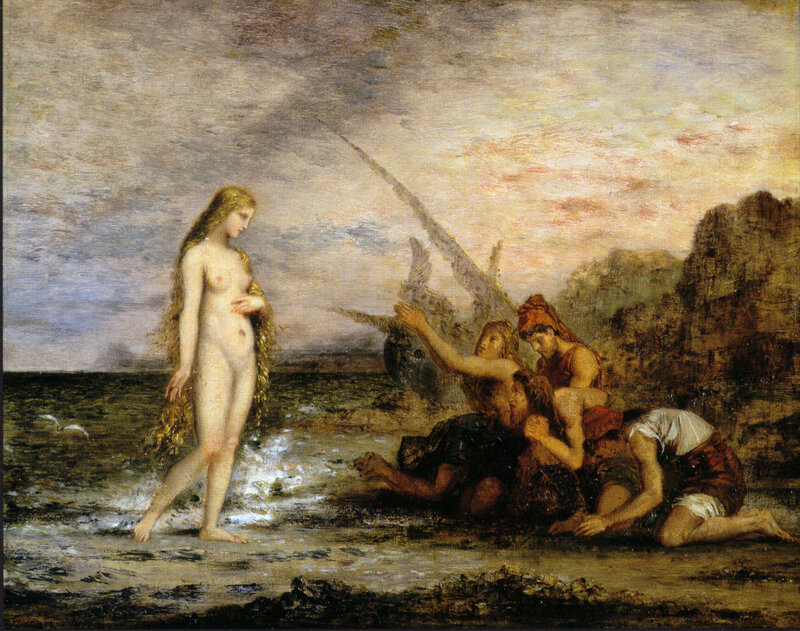 Gustave Moreau (1826–1898), Venus Rising from the Sea (1866), oil on panel, 55.5 × 44.5 cm, Israel Museum מוזיאון ישראל, Jerusalem. Wikimedia Commons. Venus Rising from the Sea (1866) looks to have been intended for exhibition, and is much richer in its imagery. Venus has just arrived from the sea, and is sitting on a coastal rock, her arms outstretched in an almost messianic pose. Her very long, thick hair cascades down the rock behind her, through her right hand, and over her left arm, glistening in the light. She has a spiculate diadem/halo around her head, and behind her, a voluminous robe billows up in the breeze. On the left, a mermaid attendant holds up half an oyster shell with a single large pearl glinting in it. On the right, a merman proffers her bright pink coral, and cradles a large conch shell. Behind them is another rugged rocky coastline of Renaissance appearance, and in the immediate foreground is a fragment of pink coral and a small collection of shells on a sandy islet. Moreau was still searching for his new, improved history painting, for a worthy success to follow Oedipus and the Sphinx. Reverting to classical narrative had not advanced his cause, and despite its great serenity, his Orpheus had not received as favourable comment as Lévy’s. Given that they had been pupils of Picot together, that must have been a bitter blow. Posted in General, Painting and tagged history, Lévy, Moreau, myth, narrative, orientalism, painting, symbolism. Bookmark the permalink.